The original Japanese science fiction kaiju film “Godzilla” (ゴジラ Gojira) was originally released 3 November 1954. Produced by Toho and Directed by Ishirō Honda with special effects by Eiji Tsuburaya, The film stars Akira Takarada, Momoko Kōchi, Akihiko Hirata, Takashi Shimura and Haruo Nakajima who portrayed the titular character until his retirement in 1972.The film features a very large prehistoric monster called Godzilla, which has been created and repeatedly resurrected by nuclear tests in the Pacific, who travels towards Tokyo and ravages Japan, reigniting horrors of nuclear devastation to the very nation that experienced it first-hand. It stars after a Japanese fishing boat is mysteriously destroyed near Odo Island, another ship is sent to investigate but also sinks. Reporters arrive on Odo Island to further investigate. A village elder tells one of the reporters that he believes the disasters are being caused by an ancient sea creature known as “Godzilla”. That same night, an unseen force comes ashore during a storm and attacks the village. So Paleontologist Kyohei Yamane leads an investigation crew to the island, where they discover giant radioactive footprints and a living trilobite. Soon Dr. Yamane and the villagers encounter Godzilla up a hill and Doctor Yamane races back to Tokyo to warn them that Godzilla has been resurrected by repeated nuclear tests. So ships are sent to deal with him,However they are no match for Godzilla who appears to have survived and makes for the mainland causing nationwide panic. So Officials appeal to Dr. Yamane for ideas to kill the monster, but Yamane wants him kept alive and studied. Meanwhile Dr. Yamane’s daughter, Emiko, is given a demonstration by Dr Yamane’s work colleague Dr. Serizawa of his recent project which horrifies her. Later That night Godzilla surfaces from Tokyo Bay and attacks the city. So a line of tall electrical towers is constructed along the coast of Tokyo, However Godzilla breaks through the electrical fences, proceeding with his rampage across Tokyo. Distraught by the devastation, so Emiko asks Hideto Ogata, a salvage ship captain, for help and informs him of Dr Serizawa’s unethical project, meanwhile Dr. Yamane warns that if more nuclear tests are conducted they will have continuing trouble with monsters. French artist Henri Matisse sadly passed away on November 3rd 1954. Born 31 December 1869 in Le Cateau-Cambrésis, Nord, he is known for his use of colour and his fluid and original draughtsmanship. Matsse was a draughtsman, printmaker, and sculptor, but is known primarily as a painter commonly regarded, along with Picasso and Marcel Duchamp, as one of the three artists who helped to define the revolutionary developments in the plastic arts in the opening decades of the 20th century, responsible for significant developments in painting and sculpture. Although he was initially labelled a Fauve (wild beast), by the 1920s he was increasingly hailed as an upholder of the classical tradition in French painting. His mastery of the expressive language of colour and drawing, displayed in a body of work spanning over a half-century, won him recognition as a leading figure in modern art. during World War II Matisse, was shocked to learn that his daughter Marguerite, was active in the Résistance and had been captured & tortured in Rennes prison and sentenced to the Ravensbrück concentration camp, but avoided further imprisonment by escaping from the Ravensbrück-bound train and survived in the woods until rescued by fellow members of the Resistance. In 1947 Matisse published Jazz, a limited-edition book containing about one hundred prints based on his colorful paper cutouts accompanied by his written thoughts. In the 1940s he also worked as a graphic artist and produced black-and-white illustrations for several books and over one hundred original lithographs at the Mourlot Studios in Paris. 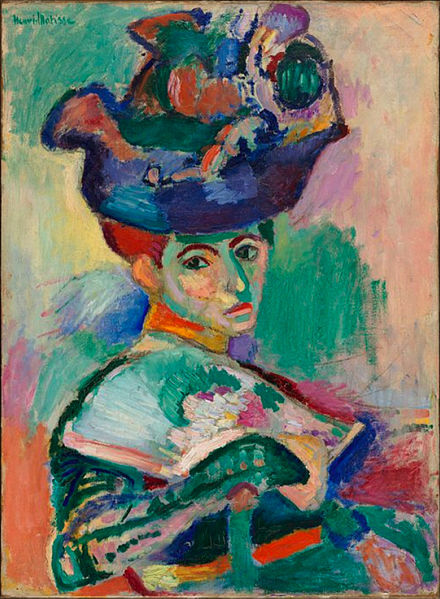 Matisse was much admired and repeatedly referred to by the Greek Nobelist poet Odysseas Elytis. Elytis was introduced to Matisse through their common friend Tériade, during the work on the Cutouts. Matisse had painted the wall of the dining room of Tériade’s residence, the Villa Natacha in Saint-Jean-Cap-Ferrat,In 1951 Matisse finished designing the interior, the glass windows and the decorations of the Chapelle du Rosaire de Vence, often referred to as the Matisse Chapel. This project was the result of the close friendship between Matisse and Sister Jacques-Marie’ He had hired her as a nurse and model in 1941 before she became a Dominican nun and they met again in Vence and started the collaboration, .In 1952 he established a museum dedicated to his work, the Matisse Museum in Le Cateau, and this museum is now the third-largest collection of Matisse works in France. Matisse’s final work was the design for a stained-glass window installed at the Union Church of Pocantico Hills near the Rockefeller estate north of New York City. “It was his final artistic creation; the maquette was on the wall of his bedroom when he died in November of 1954 of a heart attack at the age of 84. He is interred in the cemetery of the Monastère Notre Dame de Cimiez, near Nice .German media have also recently revealed th discovery of Nazi plundered art worth €1bn in Munich, including lost works by Picasso and Matisse.